This article is about the alcoholic beverage obtained from wine. For other uses, see Brandy (disambiguation). Brandy is a spirit produced by distilling wine. Brandy generally contains 35–60% alcohol by volume (70–120 US proof) and is typically drunk as an after-dinner digestif. Some brandies are aged in wooden casks. Others are coloured with caramel colouring to imitate the effect of aging, and some are produced using a combination of both aging and colouring. Varieties of wine brandy can be found across the winemaking world. Among the most renowned are Cognac and Armagnac from southwestern France. In a broader sense, the term brandy also denotes liquors obtained from the distillation of pomace (yielding pomace brandy), or mash or wine of any other fruit (fruit brandy). These products are also called eau de vie (which translates to "water of life"). The origins of brandy are tied to the development of distillation. While the process was known in classical times, it was not used for significant beverage production until the 15th century. Initially wine was distilled as a preservation method and as a way to make it easier for merchants to transport. It is also thought that wine was originally distilled to lessen the tax which was assessed by volume. The intent was to add the water removed by distillation back to the brandy shortly before consumption. It was discovered that after having been stored in wooden casks, the resulting product had improved over the original distilled spirit. In addition to removing water, the distillation process led to the formation and decomposition of numerous aromatic compounds, fundamentally altering the composition of the distillate from its source. Non-volatile substances such as pigments, sugars, and salts remained behind in the still. As a result, the taste of the distillate was often quite unlike that of the original source. A cucurbit was filled half full of the liquor from which brandy was to be drawn and then raised with a little fire until about one-sixth part was distilled, or until that which falls into the receiver was entirely flammable. This liquor, distilled only once, was called spirit of wine or brandy. Purified by another distillation (or several more), this was then called spirit of wine rectified. The second distillation was made in balneo mariae and in a glass cucurbit, and the liquor was distilled to about one half the quantity. This was further rectified as long as the operator thought necessary to produce brandy. To shorten these several distillations, which were long and troublesome, a chemical instrument was invented that reduced them to a single distillation. To test the purity of the rectified spirit of wine, a portion was ignited. If the entire contents were consumed by a fire without leaving any impurities behind, then the liquor was good. Another, better test involved putting a little gunpowder in the bottom of the spirit. If the gunpowder could ignite after the spirit was consumed by fire, then the liquor was good. As most brandies have been distilled from grapes, the regions of the world producing excellent brandies have roughly paralleled those areas producing grapes for viniculture. At the end of the 19th century, the western European markets, including by extension their overseas empires, were dominated by French and Spanish brandies and eastern Europe was dominated by brandies from the Black Sea region, including Bulgaria, the Crimea, and Georgia. In 1884, David Sarajishvili founded his brandy factory in Tbilisi, Georgia, a crossroads for Turkish, Central Asian, and Persian trade routes and a part of the Russian Empire at the time. Except for few major producers, brandy production and consumption tend to have a regional character and thus production methods significantly vary. Wine brandy is produced from a variety of grape cultivars. A special selection of cultivars, providing distinct aroma and character, is used for high-quality brandies, while cheaper ones are made from whichever wine is available. Brandy is made from so-called base wine, which significantly differs from regular table wines. It is made from early grapes in order to achieve higher acid concentration and lower sugar levels. Base wine generally contains smaller amount (up to 20 mg/l) of sulphur than regular wines, as it creates undesired copper(II) sulfate in reaction with copper in the pot stills. 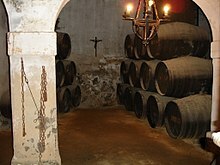 The yeast sediment produced during the fermentation may or may not be kept in the wine, depending on the brandy style. Brandy is distilled from the base wine in two phases. In the first, large part of water and solids is removed from the base, obtaining so-called "low wine", basically a concentrated wine with 28–30% ABV. In the second stage, low wine is distilled into brandy. The liquid exits the pot still in three phases, referred to as the "heads", "heart" and "tails" respectively. The first part, the "head," has an alcohol concentration of about 83% (166 US proof) and an unpleasant odour. The weak portion on the end, "tail", is discarded along with the head, and they are generally mixed with another batch of low wine, thereby entering the distillation cycle again. The middle heart fraction, richest in aromas and flavours, is preserved for later maturation. Distillation does not simply enhance the alcohol content of wine. The heat under which the product is distilled and the material of the still (usually copper) cause chemical reactions to take place during distillation. This leads to the formation of numerous new volatile aroma components, changes in relative amounts of aroma components in the wine, and the hydrolysis of components such as esters. Brandy is usually produced in pot stills (batch distillation), but the column still can also be used for continuous distillation. Distillate obtained in this manner has a higher alcohol concentration (approximately 90% ABV) and is less aromatic. Choice of the apparatus depends on the style of brandy produced. Cognac and South African brandy are examples of brandy produced in batches while many American brandies use fractional distillation in column stills. After distillation, the unaged brandy is placed into oak barrels to mature. Usually, brandies with a natural golden or brown colour are aged in oak casks (single-barrel aging). Some brandies, particularly those from Spain, are aged using the solera system, where the producer changes the barrel each year. After a period of aging, which depends on the style, class and legal requirements, the mature brandy is mixed with distilled water to reduce alcohol concentration and bottled. Some brandies have caramel colour and sugar added to simulate the appearance of barrel aging. 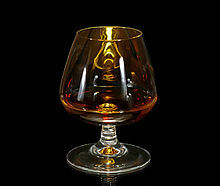 Brandy is traditionally served at room temperature (neat) from a snifter, a wine glass or a tulip glass. When drunk at room temperature, it is often slightly warmed by holding the glass cupped in the palm or by gentle heating. Excessive heating of brandy may cause the alcohol vapour to become too strong, causing its aroma to become overpowering. Brandy drinkers who like their brandy warmed may ask for the glass to be heated before the brandy is poured. Brandy may be added to other beverages to make several popular cocktails; these include the Brandy Sour, the Brandy Alexander, the Sidecar, the Brandy Daisy, and the Brandy Old Fashioned. Brandy is a common deglazing liquid used in making pan sauces for steak and other meat. It is used to create a more intense flavour in some soups, notably onion soup. In English Christmas cooking, brandy is a common flavouring in traditional foods such as Christmas cake, brandy butter, and Christmas pudding. It is also commonly used in drinks such as mulled wine, drunk during the festive season. Brandy is used to flambé dishes such as crêpe Suzette and cherries jubilee while serving. Brandy is traditionally poured over Christmas pudding and set alight. The flames consume most of the alcohol but the pudding is left with a distinctive flavour. The term brandy is a shortening of brandywine, which was derived from the Dutch word brandewijn, itself derived from gebrande wijn, which literally means "burned wine". In the general colloquial usage of the term, brandy may also be made from pomace and from fermented fruit other than grapes. If a beverage comes from a particular fruit (or multiple fruits) other than exclusively grapes, or from the must of such fruit, it may be referred to as a "fruit brandy" or "fruit spirit" or named using the specific fruit, such as "peach brandy", rather than just generically as "brandy". If pomace is the raw material, the beverage may be called "pomace brandy", "marc brandy", "grape marc", "fruit marc spirit", or "grape marc spirit"; "marc" being the pulp residue after the juice has been pressed from the fruit. Grape pomace brandy may be designated as "grappa" or "grappa brandy". Apple brandy may be referred to as "applejack". There is also a product called "grain brandy" that is made from grain spirits. In the European Union, there are regulations that require products labelled as brandy, except "grain brandy", to be produced exclusively from the distillation or redistillation of grape-based wine or grape-based "wine fortified for distillation" and aged a minimum of six months in oak. Alcoholic beverages imported to the EU from the United States or other non-EU states can be sold within the European Union using labels that refer to them as "fruit brandy" or "pomace brandy", but such a label cannot be used in the EU for products produced in an EU-member state. In the US, brandy that has been produced from other than grape wine must be labelled with a clarifying description of the type of brandy production such as "peach brandy", "fruit brandy", "dried fruit brandy", or "pomace brandy", and brandy that has not been aged in oak for at least two years must be labelled as "immature". In Canada, the regulations regarding naming conventions for brandy are similar to those of the US (provisions B.02.050–061). According to the Canadian food and drug regulations, Brandy shall be a potable alcoholic distillate, or a mixture of potable alcoholic distillates, obtained by the distillation of wine. The minimum specified aging period is six months in wood, although not necessarily oak (provision B.02.061.2). Caramel, fruit, other botanical substances, flavourings, and flavouring preparations may also be included in a product called brandy (provisions B.02.050–059). Within the European Union, the German term Weinbrand is legally equivalent to the English term "brandy", but outside the German-speaking countries it is particularly used to designate brandy from Austria and Germany. Most of American grape brandy production is situated in California. Popular brands include Christian Brothers, E&J Gallo and Korbel. Armenian brandy has been produced since the 1887 and comes from the Ararat plain in the southern part of Armenia. Bottles on the market are aged anywhere from 3 to 20 years. Armagnac is made from grapes of the Armagnac region in the southwest of France, Gers, Landes and Lot-et-Garonne. It is single-continuous distilled in a copper still and aged in oak casks from Gascony or Limousin or from the renowned Tronçais Forest in Auvergne. Armagnac was the first distilled spirit in France. Its usage was first mentioned in 1310 by Vital Du Four in a book of medicine recipes. Armagnacs have a specificity: they offer vintage qualities. Popular brands are Darroze, Baron de Sigognac, Larressingle, Delord, Laubade, Gélas and Janneau. Cognac comes from the Cognac region of France, and is double distilled using pot stills. Popular brands include Hine, Martell, Camus, Otard, Rémy Martin, Hennessy, Frapin, Delamain and Courvoisier. The European Union and some other countries legally enforce the use of "Cognac" as the exclusive name for brandy produced and distilled in the Cognac area of France, and the name "Armagnac" for brandy from the Gascony area of France. Both must also be made using traditional techniques. Since these are considered "protected designation of origin", a brandy made elsewhere may not be called Cognac in these jurisdictions, even if made in an identical manner. Cyprus brandy differs from other varieties in that its alcohol concentration is only 32% ABV (64 US proof). Dried fruit brandy is a potable alcoholic distillate, or a mixture of potable alcoholic distillates, obtained from sound dried fruit. It may contain caramel, fruit and other botanical substances, and flavouring preparations. Greek brandy is distilled from Muscat wine. Mature distillates are made from sun-dried Savatiano, Sultana and Black Corinth grape varieties blended with an aged Muscat wine. Brandy de Jerez originates from vineyards around Jerez de la Frontera in Andalusia, Spain. It is used in some sherries and is also available as a separate product. It has a protected designation of origin (PDO). Kanyak (or konyak) is a variety from Turkey that originated in the Tekel region, whose name is a variation of "cognac" and also means "burn blood" in Turkish, a reference to its use in cold weather. In Russia brandy was first produced in 1885 at the Kizlyar Brandy Factory according to a recipe brought from France. Kizlyar brandy is produced according to the classic cognac technology and is one of the most popular beverages in Russia. Also in 2008, the factory restored the status of the Kremlin Suppliers Guild. Pisco is a strong, colourless to amber-coloured brandy produced in specific regions of Peru and Chile. The name Pisco derives from the Peruvian port of the same name. Pisco is still made in Peru and Chile but the right to produce and market it is subject to disputes between both countries. South African brandies are, by law, made almost exactly as Cognac, using a double distillation process in copper pot stills followed by aging in oak barrels for a minimum of three years. Because of this, South African brandies are a very high quality. Italian Stravecchio has been produced since the 1700s in the North of Italy, especially in Emilia-Romagna and Veneto, using grapes popular in winemaking such as Sangiovese and Grignolino. Colour, texture and finish are most resembling those of their French and Spanish counterparts. Most popular brands are Vecchia Romagna, Stravecchio Branca and Stock 84. Northern Italy is also noted since the Middle Ages for another type of wine spirit, Grappa, which is generally colourless but has some top-shelf varieties called barrique which are aged in oak casks and achieve the same caramel colour as regular brandies. There is a vast production of Stravecchios and Grappas in Italy, with more than 600 large, medium or small distilleries in operation. Ticino is also allowed to produce pomace brandy under the name of Grappa. V.S.O.P. ("very superior old pale"), Reserve or ✯✯✯✯✯ (five stars) designates a blend in which the youngest brandy is stored for at least four years in a cask. XO ("extra old") or Napoléon designates a blend in which the youngest brandy is stored for at least six years. Hors d'âge ("beyond age") is a designation which is formally equal to XO for Cognac, but for Armagnac designates brandy that is at least ten years old. In practice the term is used by producers to market a high-quality product beyond the official age scale. Brandy de Jerez Solera: one year old. Brandy de Jerez Solera Reserva: three years old. Brandy de Jerez Solera Gran Reserva: ten years old. "Three stars" or ✯✯✯ designates the brandy with the youngest component cask-aged for at least two years, analogous to the French V.S. "Four stars" or ✯✯✯✯ is for the blends where the youngest brandy is aged for at least three years. "Five stars" or ✯✯✯✯✯ means that the youngest brandy in the blend was aged four years, similar to the French V.S.O.P. КВ/KV ("Aged Cognac") is a designation corresponding to "XO" or "Napoléon", meaning that the youngest spirit in the blend is at least 6 years old. КВВК/KVVK ("Aged Cognac, Superior Quality") designates the eight years old blends and tends to be used only for the highest quality vintages. КС/KS ("Old Cognac"): At least ten years of aging for the youngest spirit in the blend (similar to the Armagnac's "Hors d'âge"). ОС/OS ("Very Old"): Beyond the French system and designates the blends older than 20 years. This article incorporates text from a publication now in the public domain: Chisholm, Hugh, ed. (1911). "Brandy" . Encyclopædia Britannica (11th ed.). Cambridge University Press. ^ "Brandy". BBC. Retrieved 22 July 2014. ^ Kirk-Othmer Food and Feed Technology. John Wiley & Sons. 14 December 2007. p. 151. ISBN 9780470174487. ^ British Nutrition Foundation's Task Force (2008). Gail Goldberg (ed.). Plants: Diet and Health. John Wiley & Sons. p. 174. ISBN 9781405147729. ^ Nicholas Faith (2013). Cognac: The story of the world's greatest brandy. Infinite Ideas. ISBN 9781906821791. ^ L. M. Cullen (2002). The Brandy Trade Under the Ancien Régime. Cambridge University Press. ISBN 9780521890984. This article incorporates text from a publication now in the public domain: Chambers, Ephraim, ed. (1728). "Brandy". Cyclopædia, or an Universal Dictionary of Arts and Sciences (first ed.). James and John Knapton, et al. ^ "Sarajishvili Brandy Made in Georgia". International Wine Tourism Conference. 5 April 2014. ^ a b c d e f g Charles W. Bamforth, Robert E. Ward, ed. (2014). "5.2. Brandy". The Oxford Handbook of Food Fermentations. pp. 249–252. ISBN 9780199742707. ^ Charles Dubow (14 March 1998). "Cognac Q&A". Forbes magazine. ^ Oxford English Dictionary. Oxford, England: Oxford University Press. 1989. ^ a b c "Standards of Identity for Distilled Spirits, Title 27 Code of Federal Regulations, Pt. 5.22" (PDF). Retrieved 3 March 2011. ^ EC regulation No. 110/2008, Annex II, nn 3. ^ "Regulation (EC) No. 110/2008 of the European Parliament and of the Council of 15 January 2008 "on the definition, description, presentation, labelling and the protection of spirit drinks"". Retrieved 22 July 2014. ^ EC regulation No. 110/2008, Annex II, nn 3–9u. ^ "Food and Drug Regulations, C.R.C., c. 870". Laws.justice.gc.ca. Retrieved 12 March 2012. ^ a b Branch, Legislative Services. "Consolidated federal laws of canada, Food and Drug Regulations". laws.justice.gc.ca. Retrieved 18 July 2017. ^ "Brandy producers up in arms over EU directive". Cyprus Mail. 27 June 2001. ^ Lichine, Alexis. Alexis Lichine’s New Encyclopedia of Wines & Spirits, 5th edition, (New York: Alfred A. Knopf, 1987). Page 464. ^ "Bulk Brandy Producer, Rudolf Prehn GmbH". Prehn.com. Retrieved 12 March 2012. ^ "KIZLAR • Big Russian Encyclopedia - electronic version". bigenc.ru. Retrieved 8 January 2019. ^ "About factory". www.kkz1885.com. Retrieved 7 January 2019. ^ "Science and the Enterprises". RTG CORP. Retrieved 7 January 2019. ^ ""HE WAS MADLY CONCERNED WITH IDEAS OF THEIR CASE ..."". www.trud.ru. 15 November 2001. Retrieved 7 January 2019. ^ "Коньяк не терпит суеты". expert.ru. Retrieved 7 January 2019. ^ a b правды», Комсомольская правда | Сайт «Комсомольской (21 August 2009). "Кизлярский коньяк: традиционный вкус и верность качеству". KP.RU - сайт «Комсомольской правды» (in Russian). Retrieved 7 January 2019. ^ "Supplier of the Moscow Kremlin". www.kremlin-guild.ru. Retrieved 7 January 2019. ^ Ray Foley (2011). The Ultimate Little Cocktail Book. Sourcebooks, Inc. ISBN 9781402254109. Retrieved 9 July 2014. ^ "South Africa wins Best Brandy in the World". Southafrica.net. Archived from the original on 16 March 2012. Retrieved 12 March 2012. ^ Товароведение и экспертиза вкусовых товаров: Учебник для вузов. Издательский дом "Питер". p. 137. ISBN 978-5-94723-971-3. ^ "Сроки выдержки VS, VSOP, XO, КВ, КВВК, КС, ОС". Cognac Museum Moscow. Retrieved 14 March 2018. Wikimedia Commons has media related to Brandy. "Brandy" . Collier's New Encyclopedia. 1921. "Brandy" . Encyclopedia Americana. 1920.